There has been a lot of doomsday talk in and about Turkey recently, particularly in the lead-up to, and as a result of the recent referendum on the constitution. The essence of the talk seems to be that Turkey is lurching inexorably back into the Islamic world, and eighty-seven years of secular, Western-oriented progress, instigated by the revered founder of the Turkish Republic, Mustafa Kemal Atatürk, is being systematically unravelled. The most recent evidence of this retrogression, so the doom-sayers tell us, is the violence that took place in the inner-city district of Tophane, where a gang of thugs, armed with clubs, knives and pepper-spray (an interestingly modern addition to traditional armament) set upon citizens peacefully attending the opening of several art galleries in the area. Well, let me say at the outset that I do not, in any way, condone this kind of street violence. It is unconscionable that citizens attending such an event, folks you would normally expect to be peaceful, intellectual, even a little other-worldly, should end up in hospital with knife wounds and concussion while going about their lawful business. Art gallery owners, victims, and their friends and families are rightfully angry about what happened on 21 September. I must admit, there are times when I despair of the world, and feel that the end of civilisation as I have known it, is assuredly at hand. Usually, however, the feeling passes, I get matters back into some kind of perspective, and remember that life, on the whole, is pretty comfortable for me, and others in the circles I generally move in. So let’s step back from the events of that Tuesday night, and try to take a broader view. First, then, there is the matter of street violence. Of course it’s a nasty matter, and, for those immediately affected, extremely traumatising. However, a scrap which sees five people treated at hospital for relatively minor injuries, and seven taken into police custody, hardly qualifies as an apocalyptic event. In fact, on the microcosmic level, if two of the injured had not been foreign citizens, and those set upon had not been well-heeled attendees of an art gallery opening, the fracas would very likely have received no media attention at all, and certainly not have made international news. Worse things happen, I’m sure, on a pretty regular basis, in any major Western city – and Istanbul has a population of more than twelve million. On another level, however, there is an important insight into Turkish society provided by this event. Ten years ago, in April 2000, hundreds of supporters of the English Football club, Leeds United, arrived in Istanbul to attend the UEFA Cup match with the local side Galatasaray. Prior to the match, a group of Leeds fans managed to get themselves into an altercation with some natives, with the tragic result that one Englishman was stabbed to death, and another ended up in hospital with a serious knife wound. Again, you cannot condone the violence, but as a visitor to Turkey, you should take the trouble to look into the local character. Turks are famed for their friendliness and hospitality to visitors. They are generally slow to anger, as anyone knows who has witnessed the anarchy on the roads of Istanbul, and the relatively few incidences of road-rage. On the other hand, it is well known that, once a fight does break out, there is no backing down. Carrying an offensive weapon is not uncommon, and bloodshed is a predictable result. Every year I go to the main police security HQ in Istanbul to renew my residence and work permit. As we enter the premises, of course, we are x-rayed and searched. An interesting variant on what I was used to, however, is the desk to which you can surrender your firearm, where it will be looked after until you have completed your business. For this reason, local bystanders tend to do all they can to prevent an argument escalating to violence. As a general rule, it’s better to avoid getting into a fight with a Turk if you can do so with honour preserved on both sides. Which brings me to the next level of my analysis: the reasons for the conflict in Tophane. I read an article some months ago in the Turkish Airlines in-flight magazine ‘Skylife’, commenting on the transformation taking place in the historic area of Tophane. Gentrification is a relatively recent phenomenon in Istanbul, but it has long been common elsewhere, and the stages of the process are well known. The writer of the article describes how the gentrification process spread from the fringes of the neighbouring, already developed districts of Cihangir and Beyoğlu. The arty middle-classes were lured by the opening of a large new city art gallery, Istanbul Modern, in a huge old warehouse on the Bosporus shore. They began to see the potential of an area characterised by run-down, but attractive 19th century buildings with low rents or price tags. A new kind of resident moved in; art galleries, antique shops and up-market charcuteries opened, local small businesses found their incomes increasing, and rents began to skyrocket. The city council sees urban renewal taking place at someone else’s expense, and at the same time, the potential to increase property taxes. It happens everywhere, and everyone’s a winner, right? Unfortunately, wrong. The inevitable corollary of an influx of new residents is the displacement of the old. The old residents, needless to say, are mostly poor with no voice to make themselves heard in the corridors of power. And anyway, what is their argument? You can’t hold back progress. Money talks. If you can’t pay the new rents, you’ll just have to move somewhere cheaper – generally to some soulless outer suburb where services, facilities and public transport are scarce. Add to that, the Turkish concept of ‘mahalle’: the inner-city neighbourhood with an identity created by inhabitants whose families have lived there perhaps for generations; whose children have attended local schools; whose small businessmen mostly live in the area, are on first name terms with their customers and have a vested interest in supporting the local economy. Residents of the mahalle know each other, and know when a stranger turns up. They help bring up each other’s children, are jealous of the reputation of their neighbourhood and for the most part, police themselves. Well, it’s not just a Turkish thing, of course. The same spirit existed in Western cities too, in the past, until it was largely swept away by urban renewal and gentrification. This, of course, is the point I want to make here. ‘Tophaneliler’ (old residents of Tophane) see their neighbourhood being invaded en masse by new breed of neighbour who cares little, if at all, for the old ways. They feel themselves being pushed out, and perhaps feel some natural resentment. The resentment can easily turn to violence when sparked by an insult, real or imagined: wealthy new-comers drinking and socialising loudly on streets where formerly this was not the done thing; a word of appreciation directed at pretty young neighbourhood lass . . . It’s not hard to imagine a likely scenario. We can acknowledge the logic of it, at the same time as we condemn the violence. The thing about Turkey is that these processes that we have observed elsewhere, are vastly complicated by the sheer age and complexity of the society that exists here. A little uphill, and west of the Tophane district stands one of Istanbul’s most famous landmarks – Galata Tower. The tower was built in 1348 as part of the fortifications of the Genoese citadel of Galata. The Genoese had been granted special rights by the grateful Byzantine Emperor after helping to win back Constantinople from the Latin invaders who had set up shop there after the forces of the 4th Crusade, supported by Genoa’s rivals the Venetians, had besieged and conquered the city. When the Ottoman Sultan, Mehmet I decided it was time finally to add Constantinople to his dominions, Tophane was one of the places he chose to site cannons with which to bombard the city walls. The name Tophane, in fact, means ‘cannon foundry’, and the old Ottoman foundry remains one of the distinctive buildings in the area today; though it now serves a more peaceful purpose as the Culture and Arts Centre of Mimar Sinan Fine Arts University. The foreshore of Tophane was the place where cargo ships and passenger liners berthed; and before that, had for centuries been docking for warships of the Ottoman Navy. We can imagine the kind of activities that existed in streets back from the waterfront. 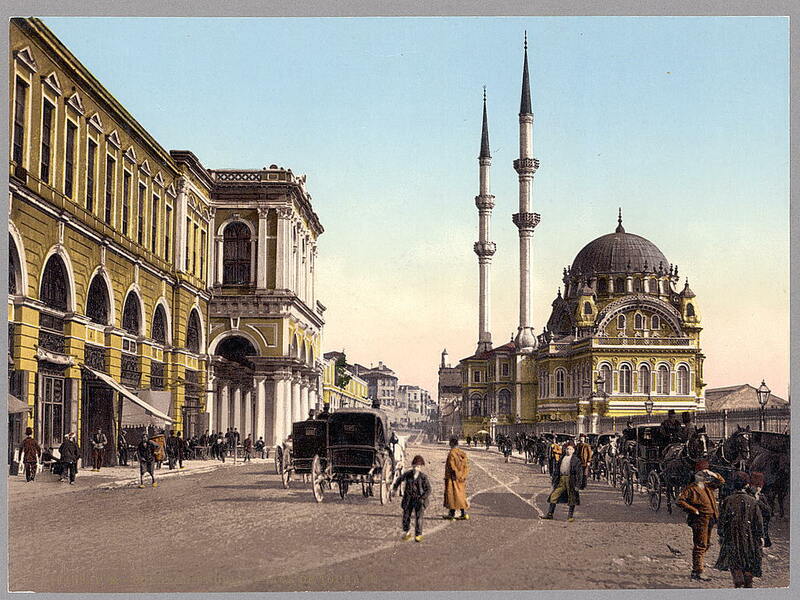 Two other historic buildings on the foreshore of Tophane are the Nüsretiye Mosque, and the mosque of Kiliç Ali Pasha. Interestingly, the former, built in 1826, was designed by the architect Krikor Balyan, of a well-known Armenian Istanbul family, members of which served as Imperial Architects to six Ottoman Sultans. The older of these two buildings was designed by Mimar Sinan (the Ottoman ‘Christopher Wren’) and built in 1580 by a gentleman known as Kiliç Ali Pasha. Despite being an Admiral of the Ottoman Navy, he was apparently born in Italy and went originally by the name of Giovanni Dionigi Galeni. Captured by the Ottomans in 1536, he was put to work as a galley slave, before converting to Islam, and rising through the ranks to end his career as Admiral of the Fleet. Why am I telling you this, you may ask. Merely to illustrate the fact that getting a handle on what’s going on in this part of the world is a complex business. Everyone knows the Ottomans were Turks and they slaughtered Armenians – yet here we have a family of Armenians designing some of the most important imperial buildings (including mosques) and, one must assume, being well rewarded for their time and trouble with money and status well into the 19th century. And the Ottoman Navy, scourge of Christian Europe in the 16th century, commanded by an Italian, who must surely have had ample opportunities to escape long before reaching the lofty rank of admiral. Events in the late 19th and early 20th centuries irreparably altered the fabric of society in Istanbul, and Turkey as a whole. What was formerly a polyglot mix of peoples, with large populations of Jews, Armenians and Greek-speaking Orthodox Christians, European businessmen and diplomats, has ostensibly become a much more homogeneous community of Turkish Muslims. Yet this apparent homogeneity is misleading. Turkishness itself is an elusive concept, imposed on a diverse and divided population in the 1920s to save what remained of the Ottoman heartland. The Turkish republic, founded in 1923, was a pre-industrial, largely rural state with a shattered economy and a population of around 13 million. By 1950 this had grown to 20 million, of which 75% still lived in small villages. In the 60 years since then, the population has grown to 75 million, and the ratio of rural to urban-dwellers has almost exactly reversed. Two inevitable concomitants of this growth have been: a huge influx of rural poor into the cities, especially Istanbul; and the rapid appearance of a large urban middle class. Returning, then, to the point whence we began our odyssey here, the events in Tophane on 21 September this year can be seen as symptomatic of the tectonic changes taking place in the society of modern Turkey. There is a dynamism evident for all to see, in the mushrooming of modern shopping complexes, the spectacular development of transport infrastructure: motorways, airports, underground rail; and the rapid growth of the private health and education sectors, especially universities. At the same time, conservative elements from villages and small towns are more in evidence in the large urban centres; denizens of traditional inner city neighbourhoods are coming into contact with the new middle classes; and inevitably there will be conflicts of interest. Governing a country as internally diverse as Turkey is no easy task – as the CHP Party is finding, in its attempts to become a credible opposition. To be Republican is one thing; to be a party of the People, quite another. Every democratically elected government of Turkey since the first free election in 1946 has had to compromise between the secular ideals of the Atatürk revolution, and the religious beliefs of the majority of voters. Compromise, however, is the essence of politics – and the ability to compromise on issues of national importance, the mark of a mature democracy. It’s been thirty years since Turkey had its last military coup, and the likelihood of another seems increasingly remote. That has to be a healthy sign. This entry was posted in Armenian genocide, Ottoman Empire, Turkish Republic. Bookmark the permalink. ← The Turks are Coming! Another force in world rugby?